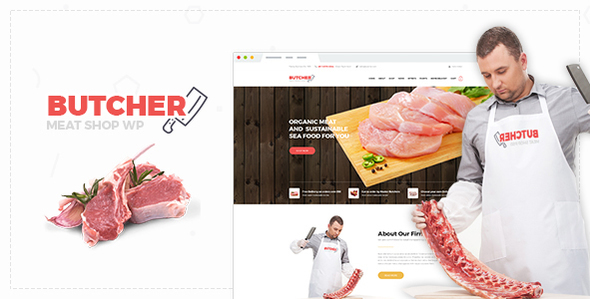 Butcher is a tidy and responsive Meat Shop Woocommerce WordPress Theme suitable for any kind of meat Shop or similar websites that needs a feature rich and beautiful presence online with flexible design. Beside a large number of features, this theme is a perfect template for leaving a positive impression to your customers. Butcher theme support you many great tools to enable the features via using Theme Options, you also can customize Google fonts and theme color without code very easy and simple. Finally, every single element of in Butcher is entirely responsive, as content can be viewed from desktop and mobile devices. SAVE YOU $18 – The WordPress theme includes the best selling slider plugin – Slider Revolution (save you $18). Compatible with WooCommerce 3.3.x, WooCommerce 3.2.x, WooCommerce 3.1.x, WooCommerce 3.0.x, WooCommerce 2.6.x, WooCommerce 2.5, WooCommerce 2.4.x, WooCommerce 2.3.x. Butcher has been tested with browsers IE9, IE10, IE11, Firefox, Safari, Opera, Chrome, Edge.